Decision: Should you play Flickering Step? Author's Note: Bottomdecking is a new series of short articles where we examine bad choices that are made by reasonable people - please note that this is not meant as an indictment of any person, it's the cards that are bad, not the people. Mostly, Bottomdecking articles are a fun way for me to cut my workload while I'm busy with real life stuff (Trauma Nursing Core Competencies, in this case), and hopefully cause a couple of people to chuckle along the way. 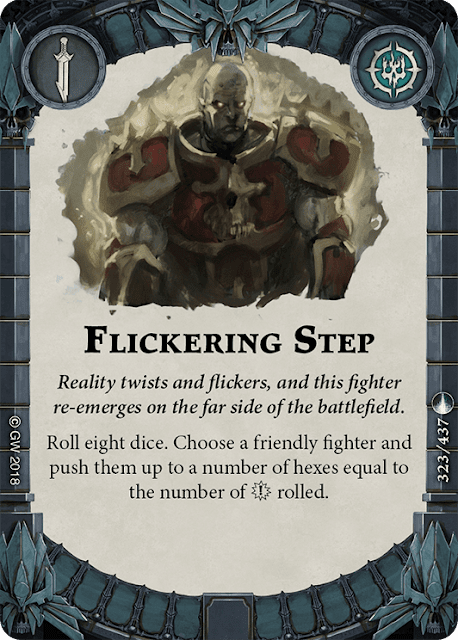 There are plenty of cards in Shadespire that allow us to push a friendly fighter 1 hex. So, if we are choosing to play Flickering Step, we must assume that the purpose is to push more than one hex. Unfortunately, the odds of that happening aren't great. On eight dice, you are going to roll 2 or more criticals slightly less than 40% of the time. In terms of reliability, that places Flickering only slightly better than Rebound, which has a much more powerful effect. It should also be noted that approximately 23% of the time, Flickering Step will do absolutely nothing. While cards that have failure chances are often worth playing, very few pack an underwhelming effect like this one. Playing Flickering Step is like playing Sidestep, but roughly one in every four times you play it a bully named Gerald rushes up to your table, flings your card across the room, kicks sand in your face, and walks away with your boyfriend. "But Author!" I hear you say, "What if I roll 8 criticals and get to push all the way across the board so I can murder Vortemis before he summons a horror?!" You won't. 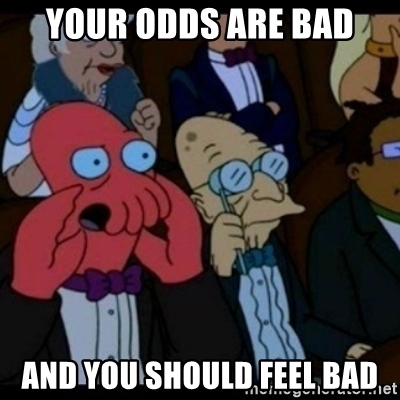 The odds of rolling 8 criticals on 8 dice are roughly 1 in 1.6 million. If, for example, you and your closest 99 friends decided to play Shadespire for 160 days straight, and each day every one of you played Flickering Step 100 times, there would still be a 37% chance that no one would roll 8 criticals on a single roll. Put a different way, it costs approximately $350 to buy every warband in the game right now. You could instead use that money to buy $6 worth tickets to the California state lottery every week for a year ($312) and have a significantly better chance of becoming a multi-millionaire than you would rolling 8 criticals on 8 dice for Flickering Step. Or, you could go place your $350 on a street bet (we like #10-12) on the local roulette wheel, win twice in a row (you're up $42k ! ), and then die from being struck by lightning. That's still twice as likely as you pushing Gurzag 8 hexes with Flickering Step. Really, the chance of rolling any number of successes over 5 is statistically insignificant - and you'll only roll 5 once in every 200 rolls; 87% of the time, you'll push 2 or fewer hexes. 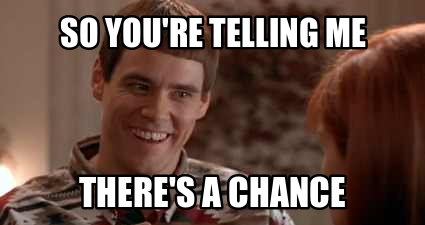 So, the odds are against you - no big deal, you've always been a lucky sort! Besides, push ploys are indisputably good; they set up attacks, move your models out of danger, and allow you to recapture objectives after you've been driven off them. So why not play a better one? Sidestep is the obvious choice here, as it always works and has no limitations on where it can go. My Turn (so good it's restricted) allows you to push 1 and attack, given the right circumstances. If you want to move more than 1, Countercharge, Mirror Move, and several warband-specific options allow for that in more limited settings. Spectral Wings will boost your move by 2, matching or beating Flickering Step for distance covered in all but 13% of rolls. Cards like Centre of Attention, Irresistible Prize, Earthquake, and Quick Advance even allow you to push multiple models. But what if you're already playing all of those? Surely Flickering Step could fit in as an additional push action? No. Try Hidden Paths. Try Illusory Fighter. Try Dancing With Death if you're that set on hating life. Flickering Step is a bad card - don't @ me.